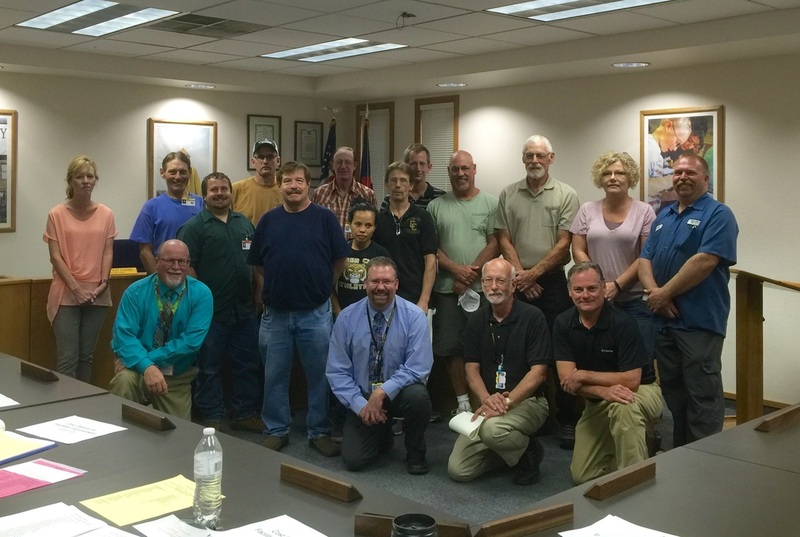 At our board of education meeting Monday evening we honored our operations, custodial, and technology staff for the outstanding work they did over the summer preparing for the 2016-17 school year. These crews are able to accomplish so much with few resources, and we know the result of their effort is safe vehicles in which to transport our kids to school, great looking buildings and grounds, and updates to technology resources that our staff and students utilize. We are excited to announce last week Cañon Exploratory School was awarded a $200,000 playground grant from the Colorado Health Foundation! Last spring former CES teacher Kelly Albrecht began the process of writing this grant by submitting a first phase application that included a request for playground structures for middle school students. Representatives from the Colorado Health Foundation came to look over the CES property and saw a tremendous need for shade, activity areas, and outdoor classroom space. We believe the Colorado Health Foundation also took into account the fact that the CES neighborhood does not have a park available for kids. This summer when Kelly moved on to a TOSA position at Washington Elementary she passed the grant application duties to Carrie Hannenberg, who solicited help from Kristi Elliott to help finalize a proposal. Carrie and Kristi finished this work in August thereby securing $200,000 to improve the CES property for the benefit of kids. Thank you ladies, for all your hard work on behalf of our children! Last Wednesday each of our schools engaged in staff development during our monthly delayed start school day. We conduct these delayed starts to allow teachers time to meet with each other in Professional Learning Communities to work on building level improvement initiatives, to analyze student achievement data, and to create solutions to building level problems. During this week's delayed start staff development time I observed the Cañon City High School staff working together to build a pathways curriculum, and I dropped in on the Washington Elementary staff as they were reviewing key concepts of their Leader In Me school culture initiative. On Monday I held an evaluation meeting with on of our directors, observed classroom instruction with Adam Hartman, and spent time with operations manager Jeff Peterson preparing for a board of education presentation on facilities options. I then attended the board work session and meeting. On Tuesday I sat in on our monthly meeting with the Cañon City Police Department, held a SAC meeting, met with our classified and certified association leaders, and dropped in to observe our new teacher induction session being guided by probationary teacher coach Jamie Davis. We conducted a delayed start staff development day on Wednesday and I observed some of this work around the district and then attended our regional health and wellness advisory council meeting. On Thursday I met with some teachers at Harrison K-8 about the implementation of our new Journeys reading resources. I also met with Fremont County DHS director Steve Clifton, and presented information about our school district at the leadership Cañon academy taking place at the PCC Fremont Campus. On Friday I met with superintendents from our region about legislative advocacy efforts for the next lawmaking session. The coming week will be quite a busy one. On Monday I'll be in Denver to work with the Colorado School Finance project to update their study to quantify what it costs to educate a child in Colorado. On my way home I'll stop in Colorado Springs to attend the CASB Regional meeting with board members Mary-Kay Evans and Shad Johnson. On Tuesday I'll drop in on the CCHS leadership team meeting, and we'll hold a district-wide instructional leader PLC in the afternoon (all principals, TOSAs and literacy coaches). On Wednesday I'll hold an evaluation meeting with a director, and I'll attend a Southern Superintendent's Group meeting. Thursday and Friday is the CASE superintendent conference in Avon, but I'll also be the Master of Ceremonies at the ECHO Legislative Symposium on Thursday eventing right here in Cañon . Thanks for listening once again and have a great week!